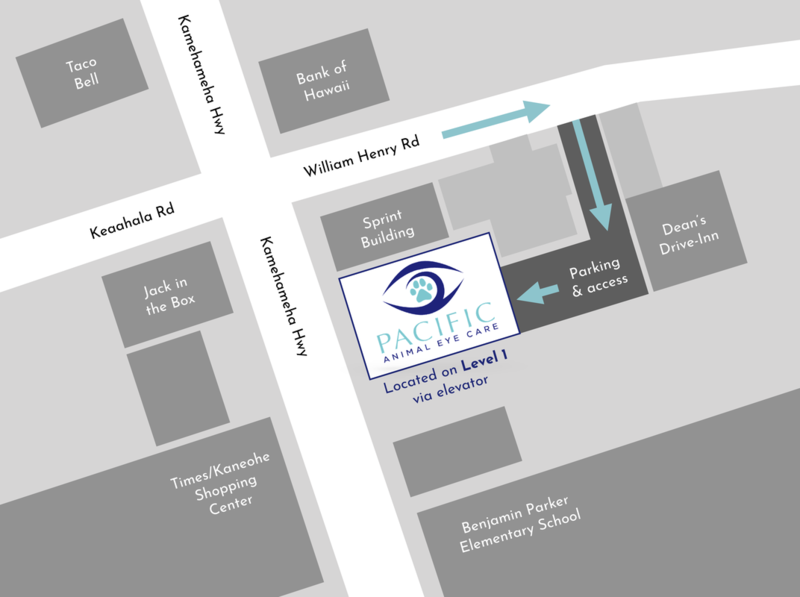 We are located near the center of Kaneohe's business district which is easy to access from most of Oahu. We are inside the new professional building located between the pink Kaneohe Medical Center and the Sprint building. We are across Kamehameha Hwy from Jack in the Box. Don't be alarmed that our location is still an empty lot on Google Maps. Our building is that new! Head north on Kamehameha Hwy into Kaneohe. We are located on the east/makai side of the street. Start looking for us as you pass the police station, Benjamin Parker Elementary School and the Kaneohe Medical Center (pink building). See below for more information on where to park. As you head south on Kamehameha Hwy into Kaneohe, you will need to turn left just after Bank of Hawaii onto William Henry Rd to access our parking lot and garage. The turn occurs BEFORE you are able to clearly see our clinic 2 buildings down on Kamehameha Hwy. You can also reach us easily from Kahekili Hwy by turning east on Kea'ahala Rd. Kea'ahala Rd becomes William Henry Rd as it crosses Kamehameha Hwy. Parking is available in the lot and garage behind our building. To get there, turn from Kamehameha Hwy onto William Henry Rd which runs between the Sprint building and Bank of Hawaii. We are the second driveway on the right, just before Dean's Drive-Inn. Look for our sign on the fence running along our driveway. Continue down the driveway past the Sprint parking structure until you are directly behind our building. Take the elevator inside the garage up to the first floor. We are in suite 103.